Petal fold envelope – closed This fold can be used as an envelope or as a card. It makes a perfect home for a poem. Simply, it a square with a half-circle added onto each side. The square is scored and you fold along those lines. Then you tuck in the half-moons one after the other to close the envelope. You can make the petal fold envelope in any size. You can even nest them, gluing a smaller one inside of another, and then inside of an even larger one. This way you open one paper flower after another, perhaps finding a tiny message in the smallest one. 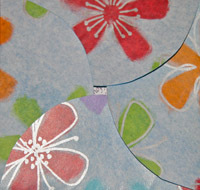 Small petal folds make good holiday ornaments. You can write one word in the center and another word on each petal. For example, PEACE in the center, and on the four folds words for peace in other languages, such as: PAX, RAUHA, AMANI, FRIEDEN (in Latin, Finnish, Swahili, and German). Then punch a small hold on the edge of one fold and string a ribbon through so you can hang the ornament. The image here is a petal fold envelope containing a poem. I glued leftover wrapping paper to regular colored construction paper on one side, and added a square of the wrapping paper to the center of the other side. I recommend using a bone folder to score the sides of the square before folding the half-moon petals, especially if the paper is cardstock. If you don't have a bone folder you can use a dull edged butter knife or the tip of a spoon to score the paper. 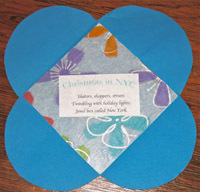 Here is a link to a petal-fold template that you can download and print out: . After you print one you can trace it on a piece of cardboard and made a sturdier template to trace on any colored paper or cardstock. See Laurie's article "A New York City Christmas"